The neighborhoods near the Somerville/Medford border are home to a number of Italian eateries, including some good ones in South Medford, Winter Hill, and Ball Square. This last spot, however, might cause some to scratch their heads, as upon first glance there does not seem to be an Italian restaurant anywhere in the neighborhood. Look again, though, and you may just see a nearly invisible dining spot on a mostly residential side street that is actually an extension of Boston Avenue, a major thoroughfare that cuts through both Medford and Somerville. This restaurant--Pescatore--is indeed one of Somerville's best-kept secrets, and one that even some locals don't know about. Pescatore really doesn't look like much from the outside, and in fact may be mistaken for a takeout joint, as the section of the restaurant that is first seen is just that. But to the right is a separate entrance that leads to a cozy dining room that is actually rather appealing with pastel colored walls, warm lighting, a tiled floor, an attractive little bar off to the side, white tablecloths with candles on the tables, large windows facing the street, and soft music in the background. The dining area once had just a handful of tables--though an expansion awhile back doubled the size of the place--but since Pescatore is such an unknown spot, it isn't all that difficult to get seated right away, especially on a weeknight. The menu at Pescatore leans a bit more toward seafood than other Italian restaurants nearby, but it also has plenty of pasta, veal, chicken, and steak dishes. Appetizers include deliciously briny haddock cakes with very little filler and a side of freshly made tartar sauce, and a wonderfully light arancini dish that includes two lightly fried arborio rice balls filled with mozzarella cheese, meat sauce, and peas and served with an outstanding marinara sauce. There are also several salad options (including an arugula, a mirabella, and a caesar), along with fish chowder, bruschetta that is overflowing with minced tomatoes, shrimp scampi, and an antipasto that comes with a delicious mix of meats, cheeses, and veggies. For entrees, the haddock Americano is tough to beat, with the haddock being sauteed in a nice mix of olive oil, white wine, and garlic and topped with lots of breadcrumbs, while the haddock paisano has the addition of cherry tomatoes added. The fusilli amalfi is another outstanding dish, with house-made pasta mixed with fresh lobster, shrimp, scallops, and broccoli rabe, while the fettuccine al salmone affumicato comes with a lot of smoked salmon and a light and mild cream sauce. Seafood fanatics should enjoy the frutti di mare, which includes shrimp, mussels, calamari, and littleneck clams with linguini, and comes with options of marinara, garlic and olive oil, and fra diavolo. For those who wish for something other than seafood, the fettuccine bolognese includes tender and slightly chewy egg noodles that are made from scratch and served with a delicious homemade meat sauce, while the pappardelle tartufo consists of house-made pasta with an aromatic black truffle oil, mushooms, and walnuts in a light cream sauce. If you aren't in the mood for Italian dishes or seafood, the steak tips here are quite good, with a nice char on the tender pieces of meat. Several desserts are offered at Pescatore, including a deeply rich tiramisu and fresh cannoli. Prices for entrees are pretty reasonable, with most entrees hovering on either side of $20. Pescatore has been in the running for best Italian restaurant on this site for a number of years now (and it once won for best seafood), and it will certainly be in the running for best Italian restaurant in the future, based on the outstanding food, decent prices, and "hidden" factor. 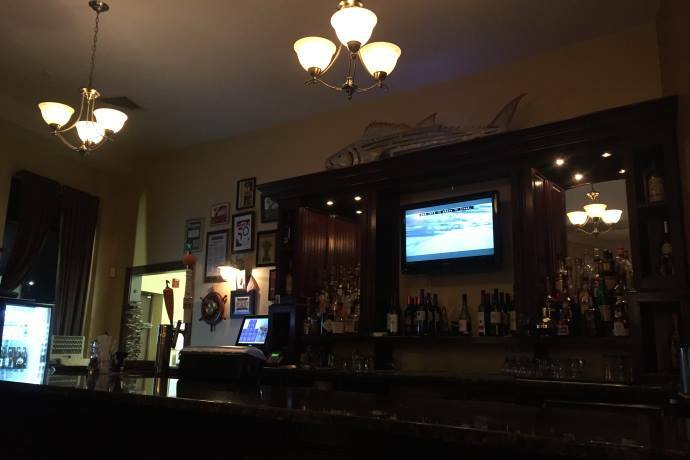 It may be an unknown spot outside of Ball Square, but Pescatore is undoubtedly a place worth seeking out if you love Italian food, or seafood for that matter. Copyright © 2008-2018, Boston's Hidden Restaurants (www.hiddenboston.com).